Shark Week starts Sunday, so it was time once again for a Shark-themed storytime. This is my third year doing one, and the kids all love it. We started with our welcome song, then I introduced the topic by bringing up how it was summer, and that in the summer a lot of people like to go to the ocean. I asked them what was one kind of fish we hoped we didn't see while we're swimming in the ocean, and it didn't take them long to say "Shark! ", and I brought out my shark puppet. I let them all feel the puppet and observe how soft it was. Then I explained that sharks don't really feel soft like that, nor are they smooth and slippery like other fish, but rather their skin is very rough and scratchy, like sandpaper. I wish I had thought to bring sandpaper for them to feel, since most didn't really know what it was. 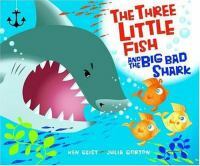 After our story song, we read one of my favorite books, The Three Little Fish and the Big Bad Shark! by Ken Geist and Julia Gorton. I love this book for several reasons: (1) it's a creative re-telling of a favorite folktalke, (2) there is lots of repetition so the kids can join in, (3) The fish having rhyming names, and (4) it teaches a lesson about how biting on hard things, or things that are not food, is bad for your teeth! It is such a fun story to read aloud, and the kids always love it. Our next story was actually not a shark story, but I wanted to do The Pout-Pout Fish by Deborah Diesen and Dan Hanna since most kids really like it, and the more they hear it, the more they seem to like it, and the author had been kind enough to send me a batch of autographed bookmarks to give to my storytime kids. 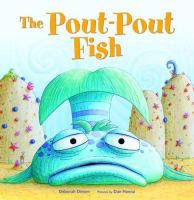 The kids like the repetition, and if they are already familiar with it, they will join right in, saying "I'm a pout-pout fish, with a pout-pout face..." and "Blub...Bluuub....Bluuuuuuub." Too bad her latest, The Pout-Pout Fish and the Bully-Bully Shark, wasn't available yet. 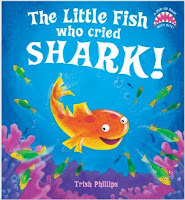 The kids were eager for another story, so I went right to another really great shark story that is also a retelling of a folktale, The Little Fish Who Cried Shark by Tricia Phillips. This is a great story made even more awesome by being a pop-up book! Little Scrat loves to play tricks on people, especially scary ones, and his favorite trick of all is to yell "Shark!" and watch everyone panic and scramble to hide. One day Scrat hears a shark warning, and ignores it, thinking someone is just playing a trick on him to get him back, but discovers sharks are no laughing matter. I am so glad I discovered this book; it's really great! I had to buy it used, but it was still in good shape. Then we sang our closing song and passed out stickers and bookmarks! As always, the subject of sharks was a big hit. 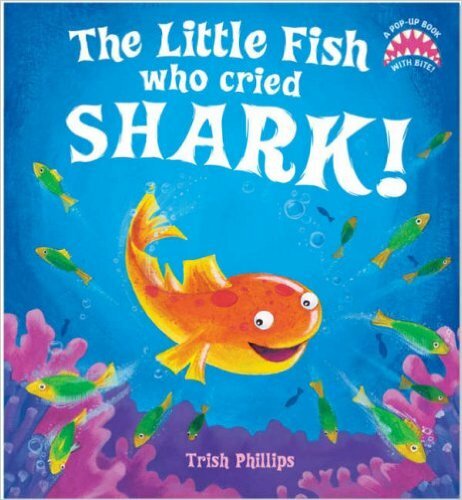 They really loved both shark stories, but didn't quite get into The Pout-Pout Fish as much. They didn't seem like they had ever heard it before, and this is one of those stories they like better after hearing it more than once, plus I guess it wasn't very fair mixing it is with the more exciting shark stories! But I did notice that I got no "Ewww"s about the kissing from this class; instead they seemed to think is was sweet and that the two fish were "in loooooooove" with each other. They enjoyed both songs, especially acting out the sharks and trying to swim away as fast as possible! For more shark stories, try my lists from 2015 and 2016 for picture books, both fiction and non-fiction. And remember, it's a bad week to be a seal!